Our designer dog sweater line consists of several uniquely crafted fleece cover-ups. They’re made for different times of year as the temperatures decline. All of our sweaters are available in many colors and different weights. Each designer sweater is carefully made by hand. Because they’re all made from technical fleece they’re engineered to keep out wind and water, retain warmth and breathe. The Boulder Sweater is a tailored garment, perfect for walks in the city winter or fall. The Boulder Sweatshirt, equally warm and cozy, has a more casual finish. It can be worn loosely, both inside and out. Dogs enjoy them in brisk fall weather. The Smart Sweater is a simple, very lightweight garment designed for chilly, post-surgery patients. 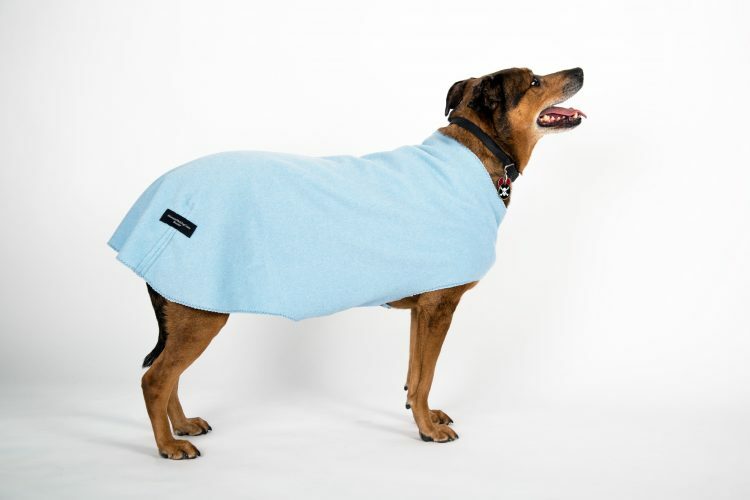 It’s meant to cover shaven areas and help your dog stay comfortable during recovery. The Smart Sweater is also worn in chilly winter homes by short-haired dogs, seniors or ill dogs. We use three different weights of Polartec fleece and Windpro. Each one has a designated warmth level ranging from very warm to light and comfy. Our Boulder Coat, Boulder Sweater and Boulder Sweatshirt are all made from Polartec 300, an amazingly warm and durable fleece. We use Polartec 100 for the Smart Sweater. The Windpro sweater is a rugged, durable, highly engineered fabric and is extremely effective at repelling wind and retaining warmth. Windpro can be substituted as a lining in all of our garments.